24 August 2018 Unlocked content from the archive. 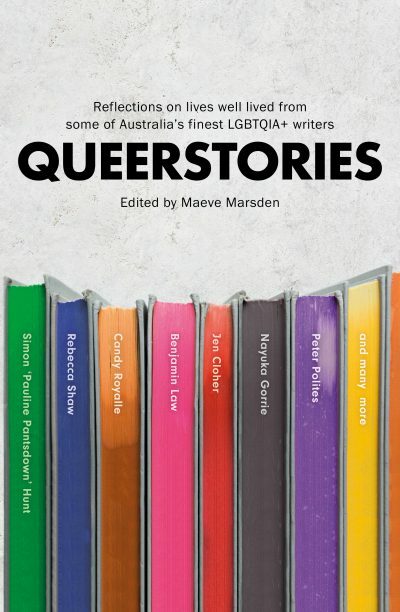 Born from the series of LGBTQIA+ storytelling events that editor Maeve Marsden curates, Queerstories showcases personal stories from 26 Australian queer icons, including Benjamin Law, Rebecca Shaw, Nayuka Gorrie and the late—but ever-powerful—Candy Royalle. Featuring a diversity of voices, the anthology does its best to capture the breadth of queer experiences, and many of the pieces focus on cross-cultural identities and intersectionality. Themes of figuring out your identity and finding your community emerge alongside issues such as the legacy of HIV. Overall, though, Queerstories is not a sombre read—there are plenty of injections of comedy, such as Amy Cooper’s confessions of childhood sins and teenage lust. The stories in this collection resist easy categorisation: stand-out pieces include Candy Bowers’ letters to activist Audre Lorde; Mama Alto’s intimate reflections on the transcendental nature of music; and Kelly Azizi’s exploration of the community’s harmful self-policing. In a market where queer voices are often sanitised, Queerstories is political and pivotal. ‘Tell the story you share when you aren’t performing for the straight gaze,’ Marsden instructs, and every piece delivers. Queerstories is an invitation for the world to listen to the queer community at its rawest and, above all, it’s a safe space for queer readers to come home to.